The Simon Says Stamp’s Flickr Challenge#43 is all about ink blending. I blended a bit of yellow (Sequeezed Lemonade) in the upper left hand corner to give a hint of the sun. The clouds were all stamped on 80# Neenah Solar White with Versmark ink and then heat embossed with silver embossing powder. I used the dies that coordinate with the cloud stamps to die-cut the clouds. I die-cut one additional cloud from craft foam to use as a backing for the center cloud so that the cloud was raised from the other clouds. This gave the clouds a more dimensional look. The raindrops were also stamped in Versamark and heat embossed in silver as was the sentiment. With so much ink blending and heat embossing, the card front became a little warped. The card front was originally 4.25” x 5.5”, but I trimmed it down to 4” x 5.5” and then matted the card front onto a 4.25” x 5.5” piece of navy card stock to reduce the warping. I also though the navy-colored mat made the card front stand out a little more. The entire thing was then mounted on an A2 top-folding card base. I hope this card doesn’t appear to gloomy even though the sentiment is a positive one. Stamps: Simon Says Stamp Falling Backgrounds (raindrops); Simon Says Stamp Cloudy Sky (clouds and sentiment). 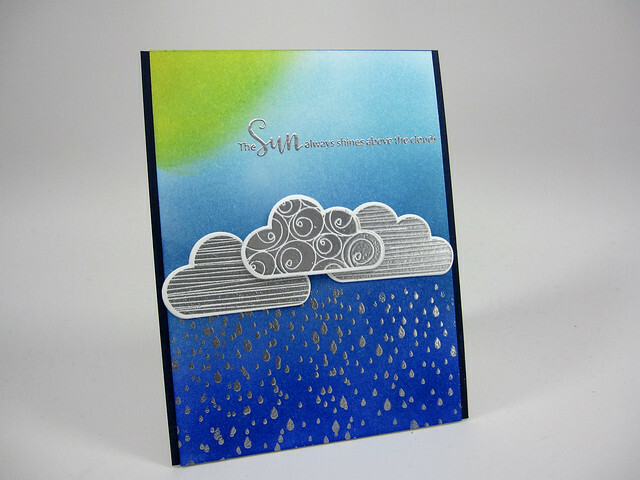 Dies: Simon Says Stamp die set: Clouds. Inks: Versamark Ink; Distress Inks: Blueprint Sketch, Faded Jeans, Tumbled Glass, and Squeezed Lemonade. Card stock: Neenah Solar White 80# for card front; Neenah Solar White 110# for the card base; Simon Says Stamp card stock in Soft Navy (mat for the card front). This entry was posted in Challenges, Encouragement and tagged Simon Says Stamp. Bookmark the permalink. ← You Are Loved: Inspiration from Starbucks!